Cross-discipline project from hardware sensor integration, network of sensors and machine learning. 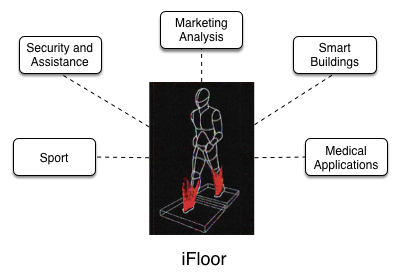 Intelligent floors for human activity detection towards sport, medical and marketing applications. The iFloor project aims at developing intelligent floors able to detect, localize and track persons in indoors environment. The proposed innovation relies on low-cost sensors integrated in the material of the floor, relaying messages to communicating nodes and computing trajectories thanks to advanced analytics procedures involving machine learning. The proposed technology brings several advantages. First, the technology will be invisible, reducing the potential perception of intrusion or surveillance. Second, the cost of the overall solution will be lower than the one relying on cameras or other portable sensors. Applications of such technology are numerous in different domains such as security, surveillance, marketing, smart buildings, health, sport and entertainment. The project team includes experts in sensor integration (inSTI), sensor network and IoT (iICT) and machine learning and software development (iCoSys).